The Preschool Potato Head Games product uses this traditional toy as a preschool lesson plan to teach math! These games will hlep support 8 preschool math process skills and other areas of growth and development! In addition to these math process skills, your preschoolers will also develop fine motor development and social skills (taking turns and waiting for their turn)! 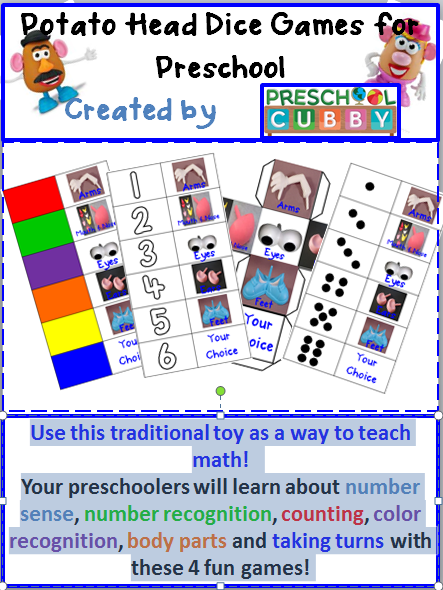 Your preschoolers will learn about number sense, number recognition, counting, color recognition, body parts and taking turns with these 4 fun games! It includes instructions for 4 games, print and fold dice cubes for each game and charts that you can laminate to use over and over again! Read on for more for details on what is included. 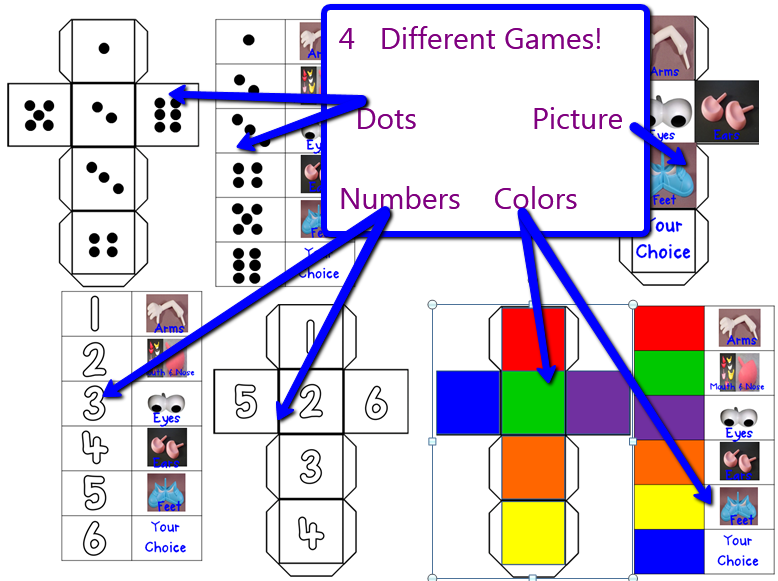 8 Page digital packet with dice and game boards to print, laminate and use! Why GAMES for Potato Heads? Can't they just PLAY with them the way they were meant to be? Well sure they could.......but they don't! Evenually the children become bored with them. Some might say they "outgrow" them. I say, just give them more to DO with them! I observed that there was at least one child who would take this bin out each day. Once the bin was out, it attracted several more children. Many of the children enjoyed making the most silly combinations as they could. But then....the "stages of potato head making" would happen. You know how this goes right? Stage 1: Make silly combinations and giggle! Stage 3: Tickle friends with the Potato Head arms. Stage 4: Turn the Potato Head arms into T-Rex claws and chase friends around the room. Stage 5: Toss the Potato Head pieces into bin from across the room. Sound familiar? Mhmmm...the stages are real! What did I do when I saw Stages 4-5 begin? "That's not how we use Potato Heads. Time to put them away." "Walking feet! Walking feet!" (followed by a time away when the little T-Rexes don't turn back into children when called). "If you're not going to use the Potato Heads "correctly", then we won't be able to play with them anymore." Each of the above responses would be based on trying to control the children's actions rather than controlling the environment. Instead, I created some math process skill developing tools to add to the Potato Heads and guess what happened? We needed MORE Potato Heads! The tools and games provided a challenge for the children who were a bit bored after a few minutes of making silly combinations with them and encouraged them to play together. 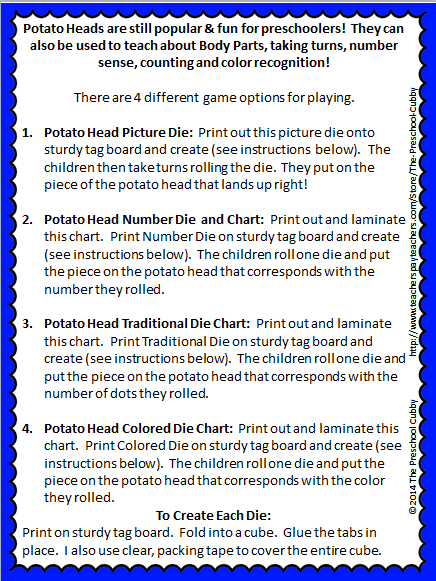 Picture Cube Game: The children roll the cube and place the item on the Potato Head that is facing up on the cube! Number Game: There is a number cube to print and a number game card. The children roll the cube and match the number that is facing up with the game card to determine which piece to place on the Potato Head! Color Game: There is a color cube and a color game card. The children roll the cube and match the color that is facing up with the game card to determine which piece to place on the Potato Head! Dot Game: There is a traditional dot die cube and dot game card. The children roll the cube and match the number of dots facing up with the game card to determine which piece to place on the Potato Head! Color recognition and matching skills. Number recognition and matching skills. Taking turns and much more!